"The Brenner Pass" is one of those place names I knew years before we began traveling. I no longer know when or why it came into my consciousness, but had been well anchored for decades. Being a familiar name was enough to make me want to see it, just like other faraway places with familiar names, names like Segovia, Budapest, and Istanbul. Oddly it wasn't until this year, our 10th year of overseas cyclotouring, that centrally located Brenner Pass made it on to Bill's itinerary. Our bikes had crested dozens of passes before Brenner, some of them several times. We'd struggled up and flown down far more dramatic unknowns like Grossglockner, Passo Pordoi, and Simplon Pass, all of which had become household words. Though the name had occupied a prominent place in my mind, Brenner Pass itself wasn't stunning when we finally arrived and we weren't even convinced we'd summited until we'd substantially descended down the other side from Italy into Austria. These are the views we've come to expect at alpine passes. "Where's the sign?" we had both asked repeatedly at was indeed the top as every proper pass has a sign at the summit announcing its name and elevation--a sign that cyclotourists often pose under for a victor's photo. "And where's the beer garden?" I asked in jest. Many Alps' passes popular with the motorcycling crowd have a couple of rustic restaurants with outdoor seating hugging the road but there was no sign, there were no satisfied guys in leathers lounging on terraces checking us out as our inclinometer indicated level ground again. My "faraway place" Brenner Pass will continue to be remembered mostly as a name even after being there. Bill had staged us so as to minimize the elevation gain for our bodies then more adapted to hiking than cycling. The early 10+% grades commanded our attention more than the 1,260' accumulated elevation. But that day, what was really on our minds as we pedaled was the threat of heavy rain. It had been a wet week in a cool, damp summer and being the middle of August hadn't kept it from looking like winter that day. The gray skies and drizzle threatened as we slowly rose up only our second significant pass of the year and we pressed on without donning our rain suits as we were quickly drenched in sweat despite the cool temperatures. The lack of a sign had us guessing we were at the summit when the parallel train tracks and truck lanes finally appeared to be aiming slightly downhill. We transferred our usual joy of seeing the expected summit sign onto seeing an unexpected EuroSpin discount supermarket sign, a sign that signaled favorite foods would soon fill our panniers. And instead of our eyes lighting upon motorcyclists lounging on a terrace, we spied a single dry bench under an unusually wide eve of a tiny sports park building. That sheltered strip of concrete pad would be our terrace to lounge upon for our picnic lunch while we watched the drizzle become a full-blown, hours-long downpour. Our comfy 'terrace' was were we took our time carefully selecting the warm garments we'd pile on for our long, steep descent; it was where we munched and methodically sealed ourselves into our every effective rain gear as we studied less-well outfitted cyclists as they cruised by with bare legs and flimsy jackets. As we each threw a well-bundled leg over our bike to venture into the rain, we were in for one more surprise from our tiny host village of Brenner, Italy, which was a giant discount mall just beyond the EuroSpin market. The flashy, practically in-the-road, soon-to-be-larger, mall and its huge parking structure were a startling contrast to the dwarfed-by-nature ambiance of other passes. The fleet of banners for factory outlet stores from the likes of Nike beckoned. No doubt we would have enjoyed an hour or 2 roaming through the sports and outdoor stores and perhaps we would have found a trophy purchase had we stopped. But we had miles to go and we knew that instead of exploring the bargains together, we would have taken turns browsing and standing guard of our loaded bikes so as to avoid being 'shopped' ourselves. As the slight lament of potentially missing some rare and rewarding shopping passed and we braced against the rain for the steep descent on the busy, rain-slickened highway, my thoughts turned to the past. Brenner Pass long had been a traditional trade route through the mountains because its low elevation makes it passable year-round. For the same reason, it was developed more fully by the Romans to link eastern Germany with central Italy. By the 14th century it had become a major trading route through the Alps and is still popular enough to at times have long back-ups of traffic. Its out of place looking, modern, steel and glass shopping mall that dwarfed the little saddle in the mountains was in a way in perfect harmony with the pass's thousands of years of history as a trading route; it was in harmony with its history even though it didn't meet my expectations of a stunning mountain pass with awesome panoramas. Bill applied himself for the 3rd year to expand our alpine hiking venues to include Austria. The first attempt was pretty much a bust; the second effort yielded 2 nice but not exceptional, locations; and this year was again proving how hard it is to trump the Italian Dolomites. 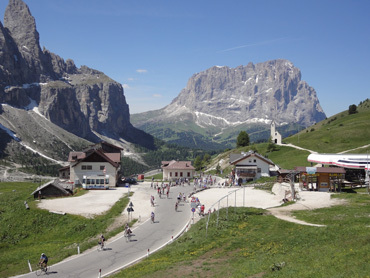 Our first north-of-the Dolomites venue for 2010 was actually in Italy at Sterzing/Vipiteno, though only by a few miles. The village culture, the demeanor of the people, and the look of the mountains all made it hard to remember we were in Italy, not Austria. A glitch with the lodging had us leaving a day earlier than planned, though without regrets, as the hiking options were much more limited than Bill anticipated. The panorama from the top of Fulpmes's lift on our very best day. Our first genuine Austrian hiking venue of 2010 was the ski village of Fulpmes, 10-15 miles before Innsbruck. It fared better as a hiking venue worthy of a second, future visit than Sterzing, though the weather and an injury kept us from fully exploring its trails. While in Sterzing, Bill had irritated his lower right leg and as the discomfort lingered, he increasingly worried that it was Achilles' tendonitis. Not wanting to risk a ruptured tendon, by the time we were settled in at Fulpmes he had he put himself on a 'relative rest' rehab program. Unfortunately the decision was made a few hours after buying a 4 day lift pass. It was back to submerging his lower leg in a pannier (substitute for a bucket or tub) filled with icy cold tap water; ibuprofen 4 times a day; and short walks to aid in both deciding upon a diagnosis and implementing a moderate treatment plan. Bill sheltering from the wind while I hiked. The weather was barely good enough for Bill to take the Fulpmes lift each day to enjoy the panoramas for a few hours while I hiked. It would have been too chilly for me to manage, but he alternated between short walks on relatively level ground; sitting in the free, wind-shielding cabanas; and reading in the unheated locker room/WC ante room which was usually a little warmer than being outdoors. While Bill read, ambled, and admired the stunning, almost 360° views in the wind, I charged up steep trails rated as "Difficult" that pushed my CV fitness and my courage to the limit. I continued my "fuss training" or foot training in my Vibram 5 Fingers; he grumbled about wearing his "orthopedic" Chaco sandals that gave a soothing bit of heel lift. I peeled off layers to speed the drying of sweat as I scrambled up scree slopes at my physiological limit; he added layers to keep warm as the minutes of low activity turned to hours. I looked down from the highest nearby peak as he looked up at it. He stewed about feeling tethered; I gloated from being asked "How old are you?" by a 43 year old male German hiker who could briefly surpass, but not sustain, my uphill pace. One of my mantras is that we should not acquire each other's disabilities, even temporarily, so we shared in many of the views from the top of Fulpmes's lift but we had very different physical experiences while there. "Beluga Red" & "Tux", new packs #2 & #1. However it wasn't only Bill's 'bum leg' that kept us off of the Via Ferratas and all day hiking trails as the summer of unusually poor weather continued to crimp our plans as it had in the Dolomites. I was greeted by harshly blowing snow (in mid-August) when I pressed to the edge of my confidence level in reaching the 8,500' peak our second trip up the mountain. We were at least sprinkled upon every day in Fulpmes though we managed not to be on the mountain during the daily downpours. Half-day outings in the middle of the day turned out to be about right for both the suitable weather and for Bill's tolerance for mostly sitting around in the persistently cool air. Extra time on our hands while in Fulpmes was put to good use by advancing Bill's quest for a snazzier backpack. 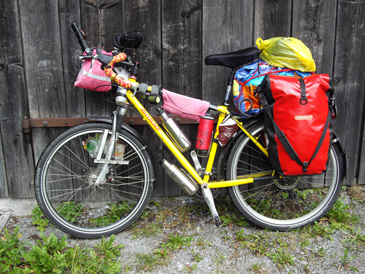 For 9+ years of cyclotouring, and increasing amounts of hiking, we had used $10-15 backpacks that folded-up into their own front pockets as our only packs, including on the more technical Via Ferratas. 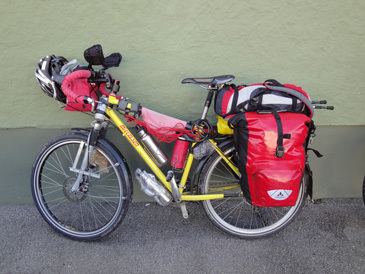 They lacked all of the nice features of modern, high-tech packs but since they spent most of their year wadded-up in our panniers, it had been the right trade-off between weight, storage volume, durability, and features. 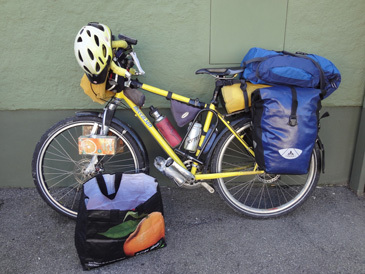 But Bill had a plan: he'd buy a bigger, more fully-featured pack and use it to replace both his minimalist backpack and the homemade mesh 'trunk' that was a second-level storage compartment on his bike's back rack. He bought 1 such pack in Moos, Italy a few weeks prior and the shortcomings of it guided him in buying a better-suited pack in Fulpmes. Fortunately, both were inexpensive experiments and he'd send 1 home in a couple of weeks with our climbing equipment for future, non-biking travel. At his urging, I too replaced my jury-rigged back rack storage system with a niftier back pack to see if I found the trade-offs worthwhile for having a better pack during the short hiking season. It wasn't a puppy in the window that turned my head at Fulpmes while Bill was scrutinizing backpacks, it was a slackline kit. I barely knew what a slackline was but, as soon as I saw the picture on the box, I wanted one. "Bill, Bill, I know what I want for Christmas" left him speechless as for us that is usually a lead-in to a joke. But after seeing the box in the closed store's window, Bill knew it was no joke and he wanted the kit too. Taking a spin on the slackline at the lift station playground. 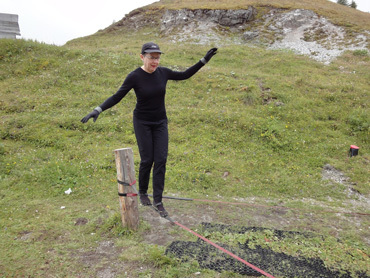 In hindsight, we'd walked on a steel cable slackline over small a creek in Corvara, Italy a month earlier but it had an overhead steel cable 'railing' upon which to cling with our sweaty hands. Slackline kits come with a long length of 2-3" wide webbing tape instead of rope or cable but are 'worked' without a handhold. Beginners such as us start with the line suspended a foot or 2 above the ground between 2 trees or posts so the many failed attempts of walking the length of it have you hopping safely onto the ground. For several years I've nudged us to imagine training to be tight rope walkers on impromptu low balance beams anytime a suitable curb or log presents itself. Retaining, or improving, balance is one of the skills on my unwritten list of activities for us to engage in so as to limit the disabilities of aging. Clearly the challenges of walking the length of a slackline would up our game over the balance beams. So, when we return home this winter, we'll buy a slackline kit and hope to set it up once a week or so in a nearby park to improve our balance skills. With our eyes sharpened to what we were seeing, we noticed that a public slackline was strung in the playground area at the top of the Fulpmes lift. Each day we were there, we took a few cracks at it upon arriving at and departing from the lift station. With slacklines on my radar, it was only days after seeing the kit that I then noticed a Tyrolean tourist magazine featuring a local pro on a highline--a line strung between crags too many hundreds or thousands of feet above ground. Being "highliners" made for good verbal foolery but we'll be thrilled the first time we walk the full length of a slackline at any height. Which is Better: Austria or Italy? It didn't take long before I was saying: "Ah, it's always pleasant to be back in Austria." The Austrian Alps don't measure-up to the Italian Dolomites nor are the more historically accurate Austrian old towns as upbeat as the reinterpretation of the traditional South Tyrol style in northern Italy, but Austria has its charms, like bike paths for starters. Dedicated multi-use paths are everywhere in Austria: in the heart of its cities; radiating into the 'burbs; and linking the communities. They are sign-posted, labeled, mapped, and maintained. Sometimes the rural routes have more demanding grades and surfaces than we'd choose, but they are plentiful nonetheless. Italy did get the jump on Austria by getting a bike path in the works on its side of the Brenner Pass whereas there was no sign of such a project on the Austrian side, but that is a rare failing in the Austrian bike network. Riding the bike/multi-use paths of Austria quickly showcases the country's commitment to the fitness of its citizens as cities, like Innsbruck, have endless miles of green spaces adjacent to the paths, often near a river. The opportunities for a free workout or bit of play in these inviting public areas are enormous and include: skateboard parks; toddler's playgrounds; huge sandboxes, occasionally with water features; bouldering walls; child-sized climbing walls; rope hammocks; whirly things to spin around in; posts for hitching your own slackline; tennis courts; dog parks; and ping-pong tables. Often there is one hard-surfaced path dedicated to pedestrian and stroller use and another for cyclists, roller blading, and other small-wheeled sports. And as I struggle to come to terms with the losses from my own aging process, I'm buoyed by seeing all the graying women my age or older flashing by us on their bikes and people of all ages playing outdoors. But like Italy, the Austria we see is full of contradictions. The multitude of bike paths and well-maintained green spaces filled with freshly painted benches, picnic tables, and fitness equipment shout that the people embrace vigor and exercise in a way that is rarely seen in Italy. And yet in Austria drinking beer and wine at any time of day is very ordinary, as is a high participation in smoking. One can't help but conclude that Austrian's are more passionate about their Catholicism than the Italians with the abundance of religious shrines scattered around villages, cities, and roads; crucifixes ever-present indoors and out; and one or more well-funded churches in every village. But cigarettes and booze are about the only things you can count on buying on Sunday in Austria and it is a country that has legalized prostitution. It seems that Austrians are sort of a conservative/progressive bunch: conservative and traditional in some ways; open-minded and pragmatic in others. We always begrudge Austria's strict Sunday closures that demand we haul more pounds of food with us starting Saturday afternoon until Monday morning, but we love some of their other practical approaches. Clean public toilets are often available and are shown on cities maps and signed on the streets. Beautiful parks and green spaces with benches make it easy for us to find a lovely shaded spot for our daily picnic. And in severe contrast to the Italians, the Austrian's seem to share our value of quiet. We spent 2 nights in a hotel flanking Innsbruck's main rail station and amazingly, I only heard the screeching of train wheels once and never heard a single platform announcement. Unlike Italy, emergency vehicle sirens were rarely heard instead of being one of the 'songs' of the cities. Blissfully, the Austrians never honk at cyclists, regardless of the situation. And the decibels emitted in a queue don't increase exponentially when surrounded by Austrians as can easily happen in even a small pack of Italians. At last, at Mayrhofen we got out from under the unpleasant side of high season--higher prices and poorer quality rooms--though curiously, still at the height of high season. Map Man planned to do in 2010 what we never do, which was be in popular places during the peak season. Unfortunately he finalized his itinerary a little late and for about a month he was stuck reserving a string of overpriced rooms that were in the "all that is left" category. 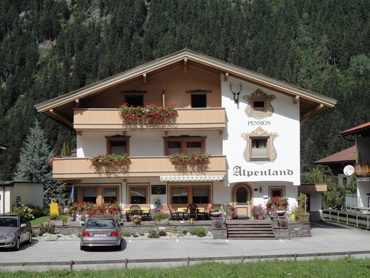 Our Mayrhofen apartment was in a traditional guesthouse. Instead of having choice furnished ski apartments for our week-long stays in Corvara and Moos, both in Italy, we had to settle for more expensive B&B's which were smaller with fewer comforts. In other villages we were confronted with solid-walled, chin high balconies or no balcony at all; low, head-knocker mansard roof ceilings with small, hazy skylights as the only windows; and musty daylight basement rooms, some with barred windows and views of tailpipes. We refused the firetraps even though we had reservations, switched to better places as we could, and made note in our Country Details file of what to avoid next time. That was until we got to Mayrhofen. It was there that Bill's planning finally was far enough out to again have some choice. It was there during the last third of August when we again were savoring an inexpensive, freshly renovated ski apartment with a separate living/dining room and 2 small balconies. Ah....only a bathtub and English news on the TV would have made it better. At Mayrhofen our abode finally met the comfort standard we hadn't enjoyed since leaving Selva in the Dolomites, but the marginal weather and Bill's injury continued to conspire to hobble our hiking. By the time we left Fulpmes Bill was satisfied that his injury wasn't Achilles' tendonitis and that is was on the mend, but even with 4 days in transit by bike to Mayrhofen (through Innsbruck), caution was still compelling on the trails. I would often charge up the nearest slope for extra conditioning during our lunch break on a half day hike while Bill let his tentative muscle attachments rest. And the weather pattern was too familiar: almost daily rain and every other day thunderstorms. Darn it anyway. Drama #1: Though we may return to Mayrhofen to give the hiking another try, I will remember it as the impromptu stage for a string of little dramas. It was at Mayrhofen that I bought packaged bread instead of fresh bakery bread and discovered that I'd been sabotaging our 2010 reduced-salt diet with bread, which had about a gram of sodium per our-sized-serving when we were targeting 1.5 grams total for a day. Instantly our year's old daily regime of tuna and bread for lunch was off the menu and we spent nearly an hour in a supermarket once again analyzing the salt content of other foods, as possible, to quickly devise a road-worthy alternative meal. 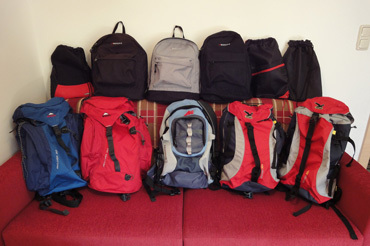 Our family of new & old packs grew even larger at Mayrhofen. With eliminating bread from our diet, we also abruptly ditched a many year's old love/hate relationship with the bread shops. Most European bread doesn't hold well to the next day, so we, like most everyone else, buy bread daily. That can be a half hour ritual of locating a shop, standing in line to make our selection, and standing in another line to pay. Some days the ritual yielded trophies, other days disappointment. Aside from giving us the welcome calories, the ritual also immersed us in the local culture of every country, some of which I will miss. 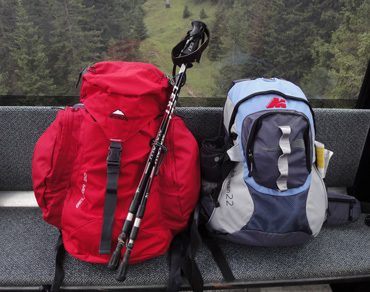 Drama #2: It was at Mayrhofen that we bought 2 more backpacks. We started the season with 2 minimalist packs and over a period of a couple of weeks, our inventory was up to 11! There was the first 'proper' pack that was quickly dismissed as being sub-optimal ("Tux"); the 2 'proper' packs we bought as replacements to the first 'proper' pack that would double as back-rack storage compartments (Beluga Red & Beluga Blue); the even better packs that we were inspired to buy to hike with in South America next winter; the even flimsier $4 bags that were little more than sleeves for a strolling with a jacket and a water bottle tucked inside when the 'proper' packs were too bulky for town; and an early purchase of a replacement of our usual packs. 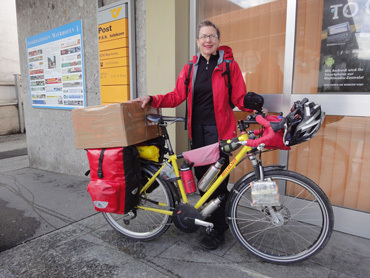 This mushrooming extravaganza of packs was shrugged-off with some difficulty as the cost of making a major transition in how we haul stuff around on our bikes. At least purchasing 9 packs of various sizes and shapes for about $200 was an exceptional value--4 on sale--plus the price of including most of them in the box of climbing equipment we would be mailing home soon. Bill's previous top-of-the-back-rack storage system (L) & his new "Beluga Blue" (R). Beluga is the model name of the pack. Barb's previous back rack storage system, plus a little extra in the yellow bag (L) & her new back pack: "S-pack." 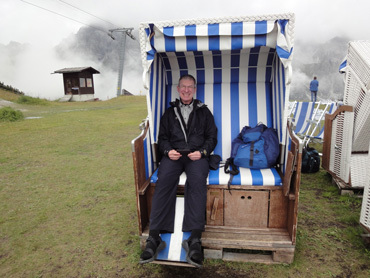 Drama #3: The rainy days at Mayrhofen with his foot up gave Bill more time for planning our first winter hiking trip, which would be to South America in early 2011. Wanting to continue cyclotouring overseas but feeling like we'd tired of too much adventure in bike-unfriendly European countries had us turning shortening the cycling season by adding more overseas hiking in the future. Overseas hiking in the southern hemisphere would give us the fitness regime we enjoy in the off season; still include some adventure in our travels; and continue to expose us to new cultures. 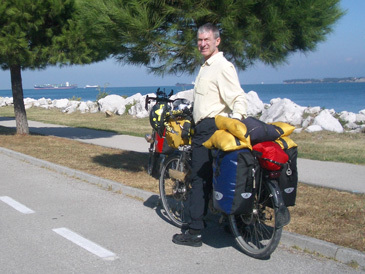 But Bill quickly became overloaded with the planning challenges as he delved into the details of traveling (without bikes) in Peru, Chile, and Argentina. There were the personal safety issues related to lawlessness; then there was horsefly season and local festivals to navigate around; reading about poorly developed tourist services and the local transportation challenges didn't help; and then the latest problem: being travelers who don't eat the most basic food, bread. "What about hiking in Texas from a rented RV?" was the question greeting me as I returned to our apartment from a trot up one of Mayrhofen's slopes. The nutrition challenge was the last straw, the issue that had him step back and look at our objectives and brainstorm a new itinerary. Hiking from an RV in the National Parks of the US southwest would give us easy control over our menu; would net us more hiking days than a trip to South America; would provide immersion in the ancient North American cultures (and the modern RV culture); and in an older rented RV, would be quite affordable. It was the relief valve that Map Man needed; suddenly planning was fun again. Suddenly we're off to Texas....in 6 months. Though we always hope for some unexpected post-season hiking, our official hiking season closes each year with the sending home of our climbing gear. The Via Ferrata sets, which include our harnesses and "epsilons" used to secure us to the Via Ferrata cables, are the reason for the shipment but they become a magnet for pounds of other gear. Whew! Made it to the Post with the box of packs & gear. The first pound is the most expensive when shipping so, once we are committed to the weight of a cardboard box and our climbing sets, the size of the needed carton keeps growing. This year "the box" is what allowed the back pack purchasing extravaganza to occur as we knew the great sale prices more than made up for the incremental shipping cost of adding additional pounds to our package. The difference between the US and the Austrian postal rates also meant that we sent home a box weighing almost 3 times more than the box we received in July for about $15 more. And I'd forgotten how easy the Austrian "Post" is to deal with--what a delight. Getting the box underway is always a huge relief, both for having the challenges of finding a suitable box at the right instant behind us and because it literally lightens our load so much. Old and new hiking maps and books are purged from Bill's panniers as are other odds and ends that are no longer needed but are too precious to throw away. Our loads are lighter than they've been all year as, in addition to the strictly summer items having been sent back, consumables, like our nutritional supplements, are also dwindling. The sadness of seeing the hiking season end is softened a bit by the noticeably easier handling of our bikes because of carrying less gear. The latest torrential downpour that darkened the skies while we packed our box and bags in our Mayrhofen apartment mercifully ceased as we headed outdoors to load our bikes. Looking up as the clouds swirled among the peaks, we could see that the morning's latest storm had dumped more snow on the mountains and at even lower levels, mountains we'd hiked during the last week. Still August and yet this was our third day of snowfall. A fresh dusting of snow the morning we left. It had been an unseasonably cool year almost everywhere we'd been. The cooler June weather in Portugal had allowed us to linger there rather than being chased out by the heat but had also been a bit of a disappointment. The 2 months we'd spent in the Italian and Austrian Alps, including the Dolomites, had been a time of almost daily rain and frequent, fierce thunderstorms. The self-discoveries of wearing our minimalist Vibram 5 Fingers on hikes and climbs had saved the season as we didn't need so many new trails or higher elevation climbs to fuel the sense of adventure but we still had to wonder what happened to our summer. Our end of August departure from Mayrhofen was brightened by brilliant skies but 2 days later we would be pedaling in heavy rains. We pressed-on towards Vienna along the Inn River on bike paths that were partially submerged at their lowest points. We couldn't help but wonder if the muddy, fast flowing rivers would soon be breaching their banks. It was now hard to imagine that there would be any bonus hiking at lower elevations during what we hoped would be a lovely fall. We'd keep pedaling and adjust our plans as possible to match the unpredictable weather. 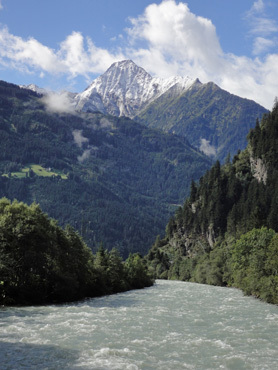 We have traversed almost all of the west to east length of Austria since leaving the Alps, meandering along and between several well-established river routes. We arrived in Vienna ahead of schedule, and ahead of our reservations, so moseyed on to Bratislava, Slovakia and took-in a Roman site on the way back. A week in Vienna, which we haven't visited for almost 10 years, was a welcome change of pace though the brisk fall wind was even more chilling as pedestrians than as cyclists. We are currently stalled-out in Graz, Austria as the annual marathon has resulted in all of the surrounding area lodging establishments being fully booked. Amazingly, we were able to get a hotel room in the center of Graz, near the start of the marathon, but not in the outlying areas along the bike route. We'll be on our way again on Monday morning, heading into Slovenia for a few days on our way south into Italy in search of warmer weather. Bill is still working on a plan for the last 2 months of this, our 10th touring season. We do know we will fly home from Amsterdam on December 2nd but the rest of our itinerary is blank at this moment.